Designed and manufactured in Canada, we offer the most complete range of products on the market and our systems are available throughout the America’s (North, Central, South) and also across Europe. Our most popular, the Octopus IP, allows the integration of a wide variety of additional options. This modular approach makes replacing an existing system unnecessary, we simply adapt the existing system to the need of the end-user. Control Plus GL is the only manufacturer to offer IP technology on liquor control systems. This technology simplifies greatly programming as well as allowing resellers or customers the possibility to manage or configure at a distance. This allows total control at all times of our system. Being the manufacturer of all major components eliminates the middle man and allows us to maintain a large inventory and aggressive prices. And pass the savings along to our customers. We offer a 3 years warranty (*) on our liquor control devices, the best on the market! 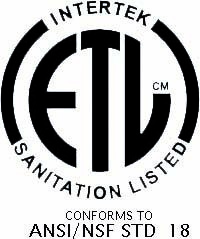 We have all the required certifications for our products to be distributed internationally (ETL-ANSI/NSF STD 18). * Limited warranty, some conditions apply. We usually deliver within 24 hours.